Zabbix comes with predefined SNMP Device Template, that is configured to access devices with SNMP version 2. Here is modified version of 3 Zabbix’s templates for use with SNMPv3. 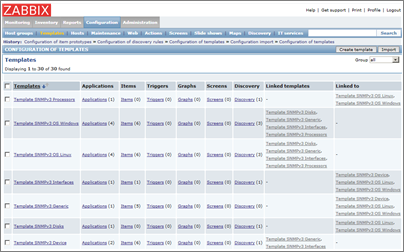 To add this new template to your Zabbix, press “Import” button on templates page and select the xml file. As Linux systems become popular, it may be used as gateway in small networks. This is the case when iptables – standard Linux firewall will come in handy. You can easily set up simple NAT-ed network with few simple command lines. So let’s imagine we have a simple netork (at home), with a Linux host, Internet gateway (cable modem or similar) and a PC host (running Windows for example). When you have a cron job that takes a while to finish, you need to be sure the next scheduled execution won’t come before completion of previous one. (For example you want file backup to finish before starting a new one). Linux has one useful utility, that addresses this specific issue – flock. This will execute /root/myscript.sh only if previous instance of this script has finished. Key -w 600 means that flock will wait for 10 minutes for previous instance of the script to finish, before aborting the execution. You may want to put 0 here or omit the -w key entirely, so the script wait for indefinitely long time for previous instance to finish. A bit better place for lock files is /var/run folder, however you may have to create a lockfile and give user write permissions for it before.